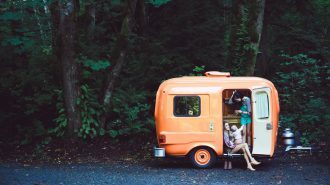 When it comes to RVing, convenience is the name of the game. You just grab a few of your favorite outfits, make sure you’ve got your adventure gear aboard, and hit the road, ready to explore a new destination. 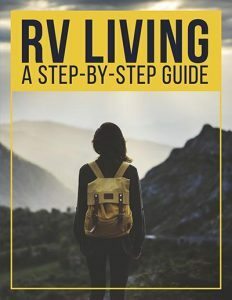 While RVs offer a whole lot of convenience and ease as compared to car camping and other forms of travel, it’s still true that a little bit of planning can go a long way. 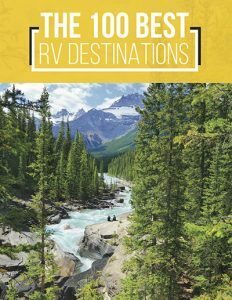 And there are certain RV items you can add to your packing list that will help ensure your camping trip is fun, comfortable, safe, and just plain better than it would be without them. 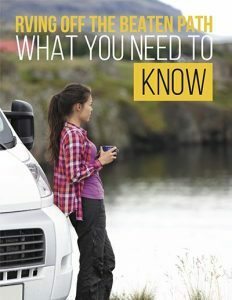 Whether you’re just starting out in the world of motorhome travel or you’re an old hat looking for a comprehensive list of go-to accessories, we’ve put together this list of some of the best RV gadgets and gear to bring along on your next camping trip. 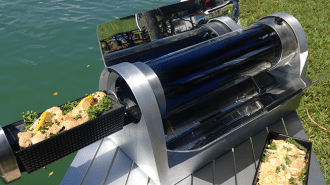 From simple little extras like water pressure gauges to heftier investments like a solar power system, this post is your ultimate guide to time-, money-, and sanity-saving RV accessories. Ready to go — in style, and with every last one of your needs met and taken care of? That’s what we thought. Let’s dive in! Some RV and camping supplies are just completely non-negotiable. If you want to feel prepared next time you hit the road, make sure you check — and double check — to ensure you’ve got the following items with you. 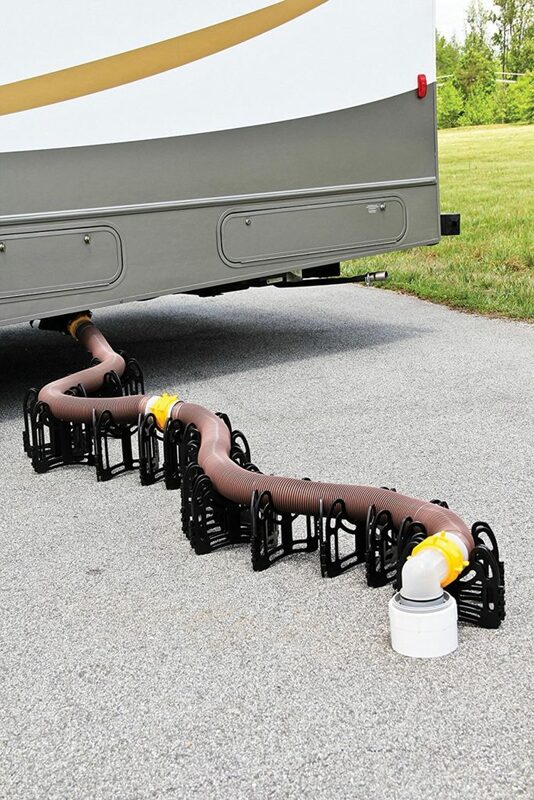 Many first-time RVers think you can use any old hose to hook up to the city water supply. And in theory, you certainly can… but the question is, do you want to? 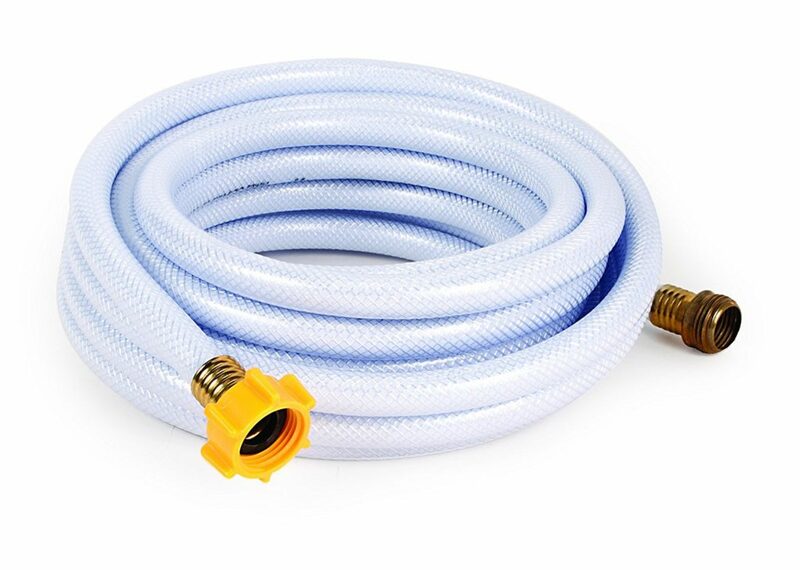 Investing in a potable water hose will ensure your fresh water supply is free of any weird chemical odors or smells, not to mention the chemicals themselves. They’re super affordable and easy to identify, since they’re always pure white in color. 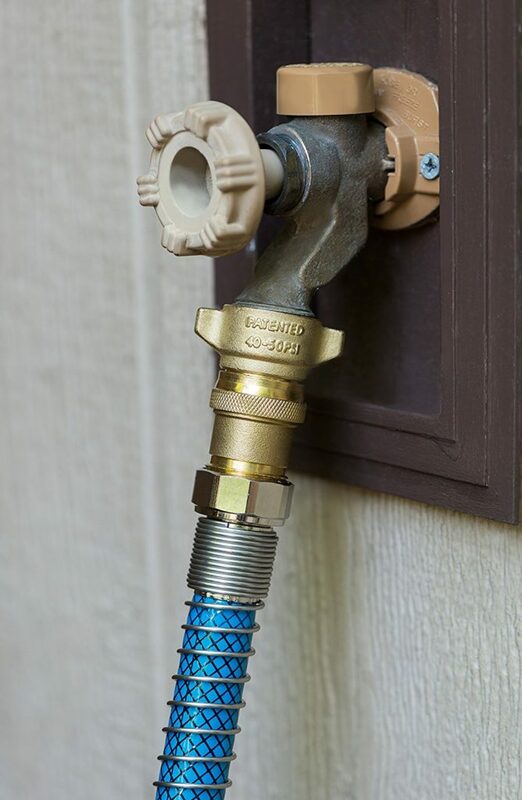 In addition to the right hose, you also need the right water pressure. Otherwise, that forceful city stream might damage your RV’s delicate plumbing equipment. Good thing an in-line water pressure regulator costs less than $10. That’s a way better price than what you’d pay the repair man! You likely already know you need a sewer hose — after all, when you’ve gotta go, you’ve gotta go, and that, um, goes for your rig as well. 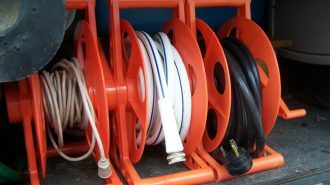 But adding a sewer hose support into the mix can help protect your hose and keep everything flowing easily, which means less potential for a messy situation during dump time. 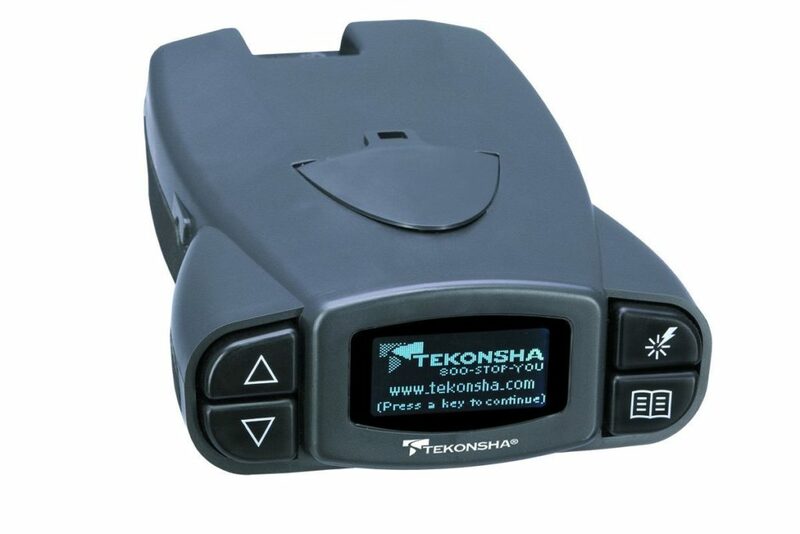 There are all sorts of RV GPS systems on the market, each with a variety of different inclusions and features. 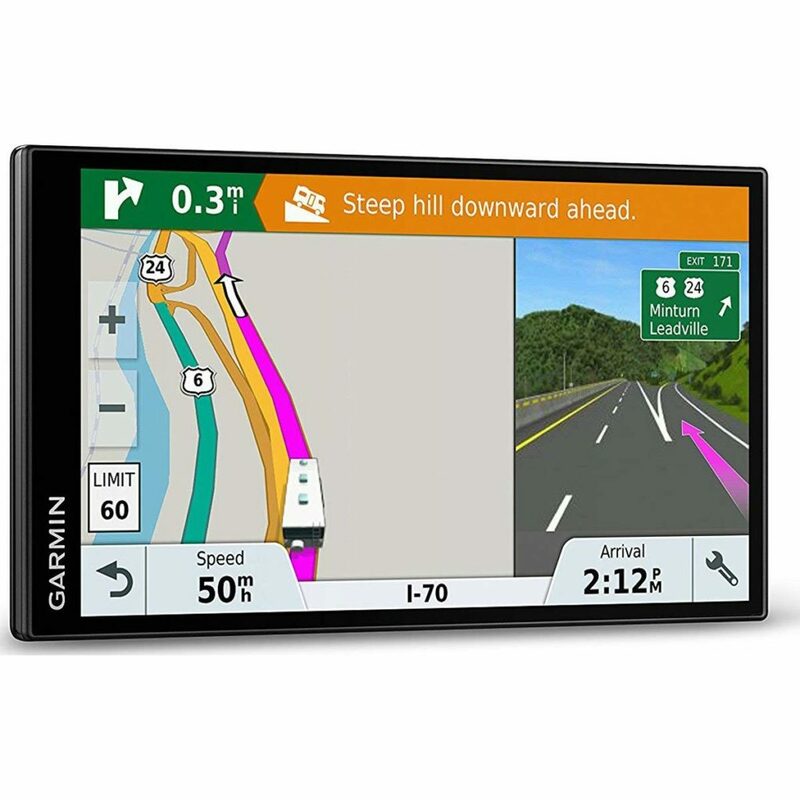 Click here to check out our definitive guide to some of the most popular RV GPS models — Garmin’s products tend to rank pretty highly. Fancy getting off the grid? 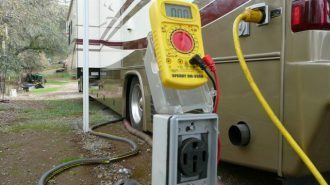 For those campers whose ideal sites are quiet vistas way out in the wilderness, upgrading from a traditional propane generator to a solar setup can be a lifesaver. 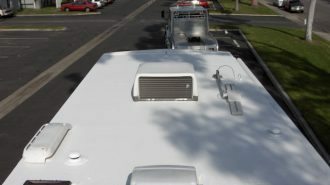 You’ll save money on LP gas, of course, but that’s minor details compared to the benefits of producing clean, noise- and fume-free energy anywhere the sun shines. Although we all wish we could be on the road all the time, relatively few of us actually get the opportunity — although that number is growing every day! However, when your RV is off the road, it’s critical that you keep it covered to avoid dirt, debris, and other potential sources of damage. The best option, of course, is to keep your RV safe and sound in a covered storage facility. (Psst: We’ve covered tons of the best RV storage facilities around the country by state; you can check out our archive here.) But for many campers, that’s simply not an option… in which case, it’s time to invest in an RV storage cover. 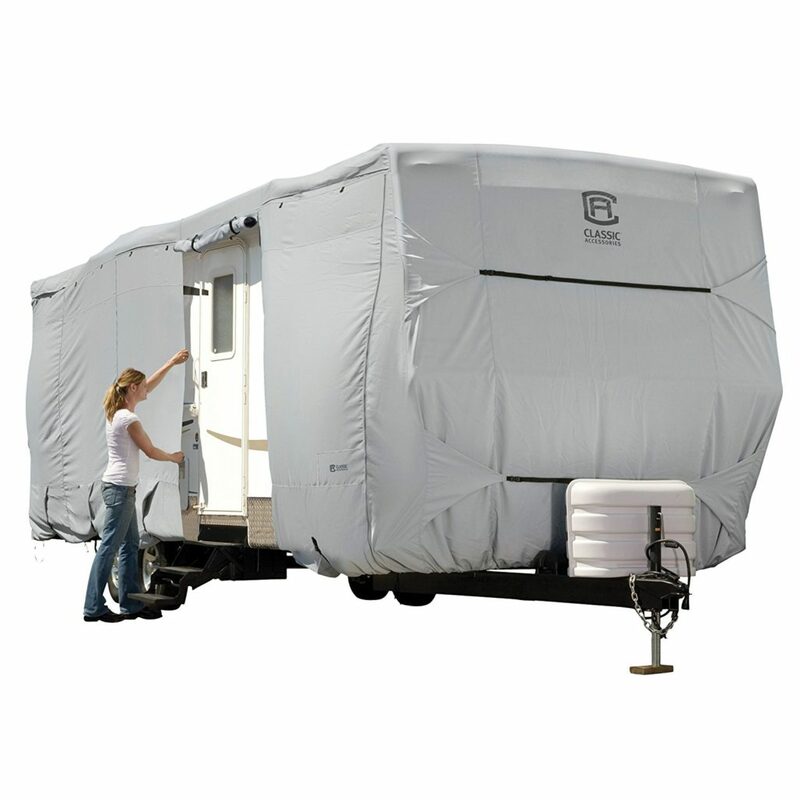 These covers will protect your RV’s finish from bird droppings, UV rays, and other hazards. And while that may not sound like a huge deal, it can go a long way toward extending the life of your investment. 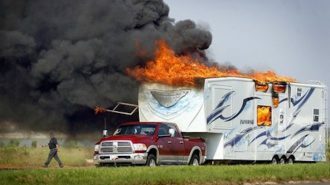 After all, the thing that usually ends an RV’s career is water damage, and leaving your rig out in the elements is basically a perfect recipe for making sure you sustain some! When shopping for a cover, make sure you find one that’s properly formulated for your RV’s size to ensure a proper fit. A cover that’s too big won’t offer the same kind of protection as one that fits just right. You’ll also want to ensure that the cover is waterproof and UV resistant for the best coverage. Lesser covers may be cheaper, but they won’t actually keep your RV safe… which is the whole point, of course. No matter how cheap an accessory is, it’s a waste of money if it doesn’t actually perform its function! Keeping an emergency kit on board is essential to ensuring you and your family stay safe on the road, no matter what unexpected obstacles you encounter. 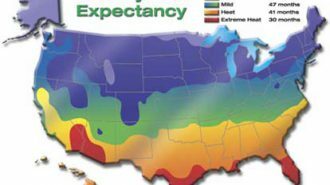 You can check out our full list of emergency gear at this post, but a few go-to essential items we suggest: extra potable water, basic first aid equipment, and emergency thermal blankets if you’re traveling in cold climates. 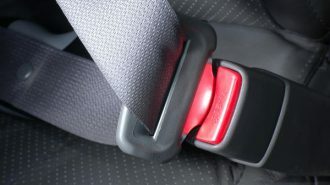 Along with emergency gear for you and your family, having emergency repair and maintenance tools on board can save you a panicked side-of-the-road moment — not to mention a large bill from the repair guy. 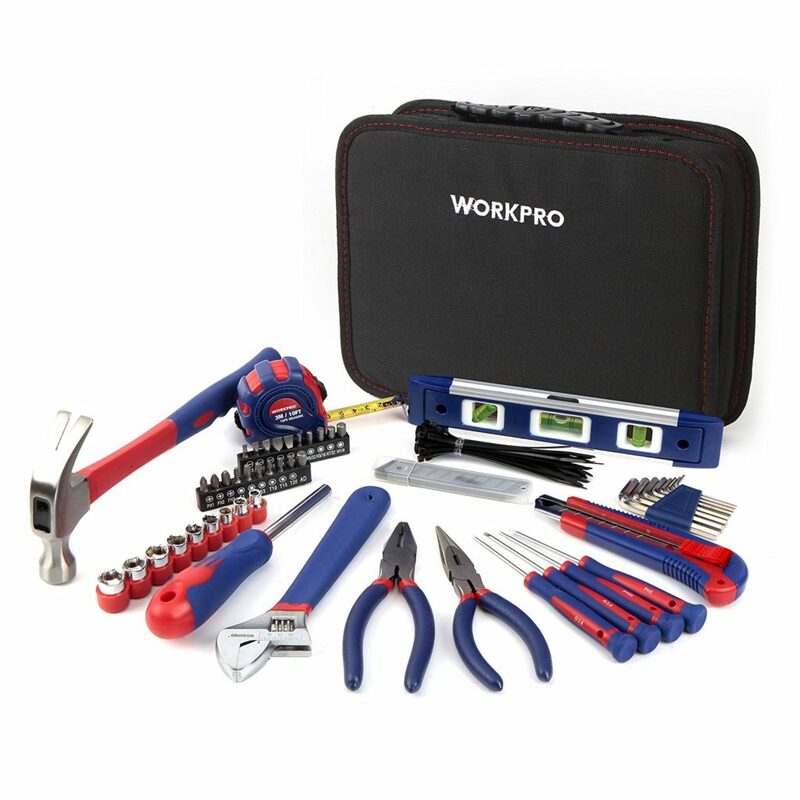 A basic roadside tool kit can go a long way, and they’re available affordably (and all-inclusively) from Amazon. The kitchen is the heart of any home, and a motorhome is no exception. These kitchen supplies and accessories will make every meal time a special treat… even before the delicious results are on the table! Yep, this dutiful little device is at the top of our list of RV kitchen accessories every. Single. Time. And for good reason. In the space of one pot’s footprint, you gain the ability to saute, stew, roast, bake, make perfectly-fluffy rice, and even ferment your own yogurt. 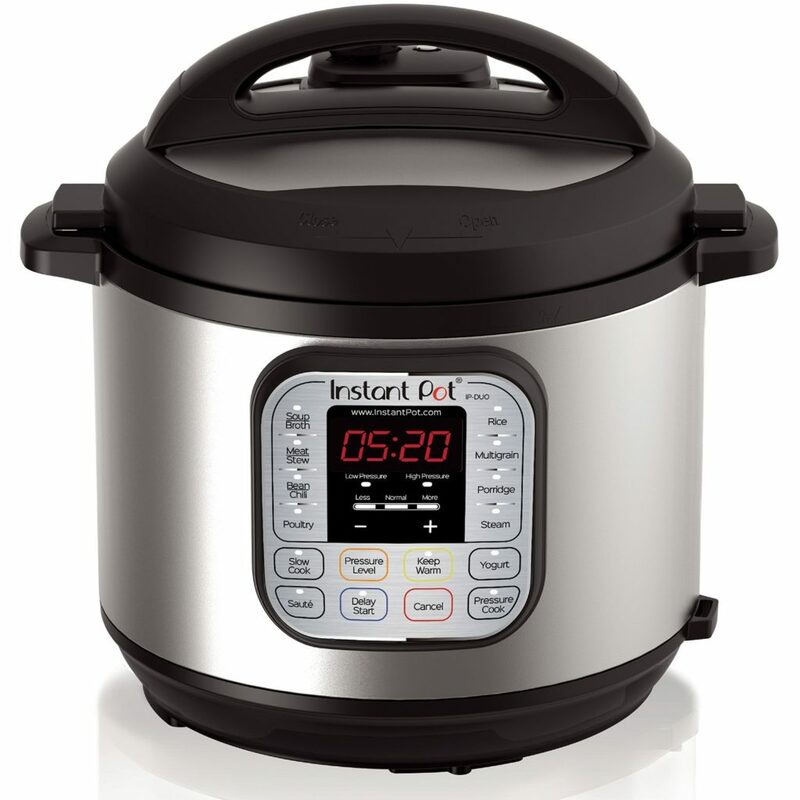 Some folks even make their own skin lotion or dog food in their trusty Instant Pot! We’re so stoked about this one-of-a-kind pressure cooker that we wrote an entire post filled with all the details you need to get the most out of your investment, including lots of yummy-looking recipes — for humans, don’t worry. But we’re pretty sure anything you throw in this thing is going to come out magically delicious, no matter what you do. Even the most spacious, luxurious Class-A diesel pusher on the market doesn’t have as much kitchen storage as a standard-sized American home. And along with cooking gear, you also have to find a way to fit all your dry foodstuffs in the same cabinets — it can be a bit of a puzzle! Investing in a set of nesting cookware can kill two birds with one stone. You’ll acquire all the kitchen accessories you need in one fell swoop, and they won’t take up more than a single pan’s footprint of your precious cabinet space. 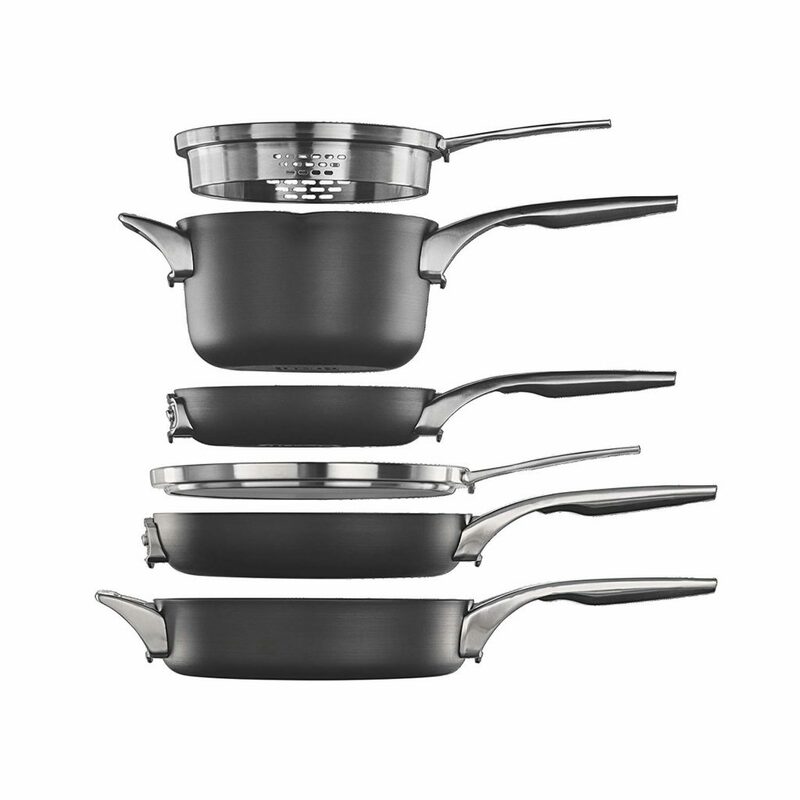 This 6-piece set from Cephalon is non-stick and durable, with stainless steel handles that allow each piece to easily go from stovetop to oven. At about $300, it’s definitely an investment up front… but when you break it down per piece (and take into account that these products can easily last a lifetime if they’re well taken-care of), we still think that’s a pretty great deal. If you’re lucky enough to have a motorhome with a conventional oven aboard, chances are it’s not quite as spacious as the one you’re used to using at home. And unless you want to find yourself unable to whip up those muffins you’re craving, you’re going to need a set of ovenware that actually fits your sized-down hot box. 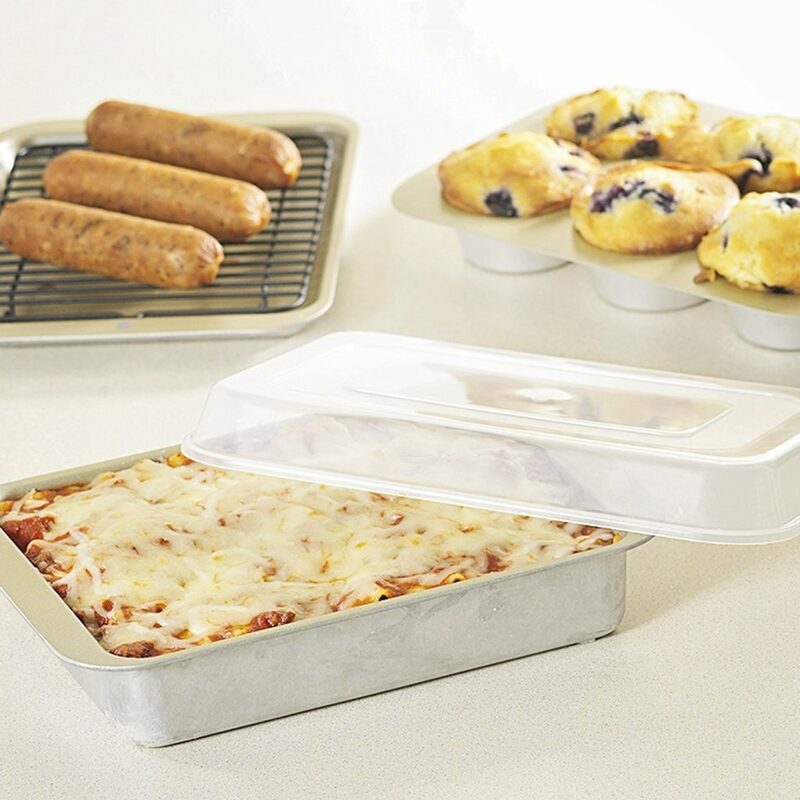 Nordic Ware makes a variety of sets of compact ovenware, all of which are appropriately sized for smaller appliances and super affordable, too. You can choose which pieces you want based on your cooking habits — click here to get started. Don’t give up on your gourmet habits just because you’re on the road! It may seem impossible to store all the herbs and spices you need to craft your favorite meals in your RV’s cabinets, but there are ways around that problem. 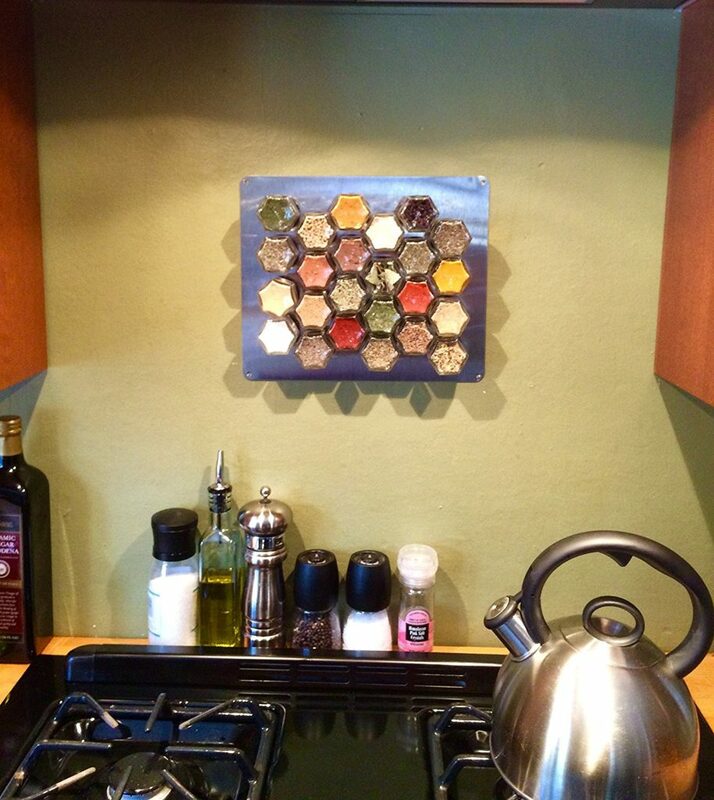 One of our favorites: keeping those flavors close at hand, yet out of the way, with a wall-mounted magnetic spice rack. You can definitely DIY one if you’re the crafty type, but they’re also available readily (and cheaply!) on Amazon — though you’ll likely need to purchase the spice jars themselves separately. Looking for more space-saving hacks when it comes to those teensy-tiny cabinets? How about dishware that all but disappears when you’re done with it? It’s no magic trick: it’s specially-made collapsible cookery, like these storage bowls or this colander. They’re made of food-grade silicone, which is both bendable (and therefore collapsible) and super easy to clean. 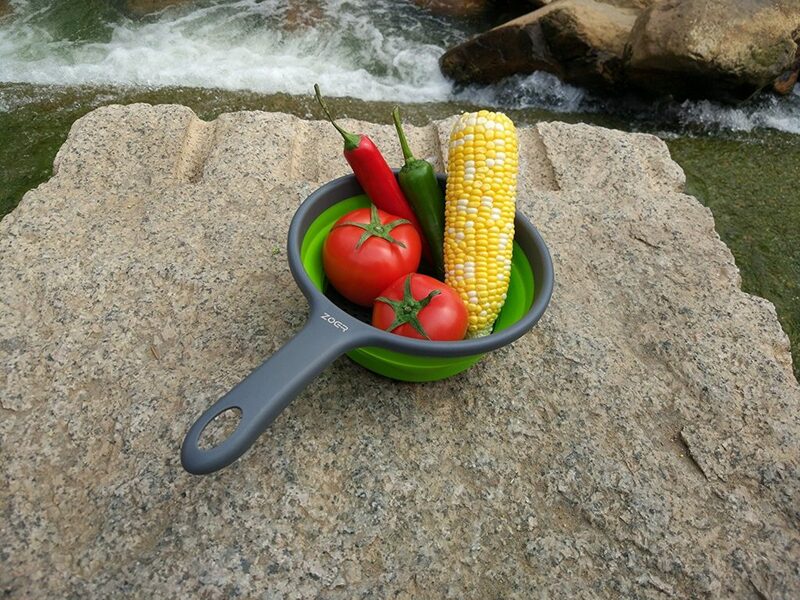 In other words, it’s like the perfect cookware for camping! 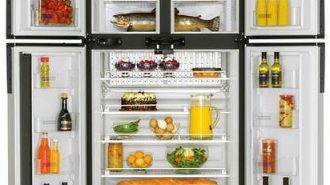 Repeat after me: Yes, it is possible to store a week’s worth of fresh, healthy food in an RV. Heck, if you’re good at Tetris, you might even be able to store two! We wrote a guide on how to cram as much fresh, delicious goodness into your limited kitchen storage space as possible — but we’ll give you a spoiler in this post: it’s all about geometry. 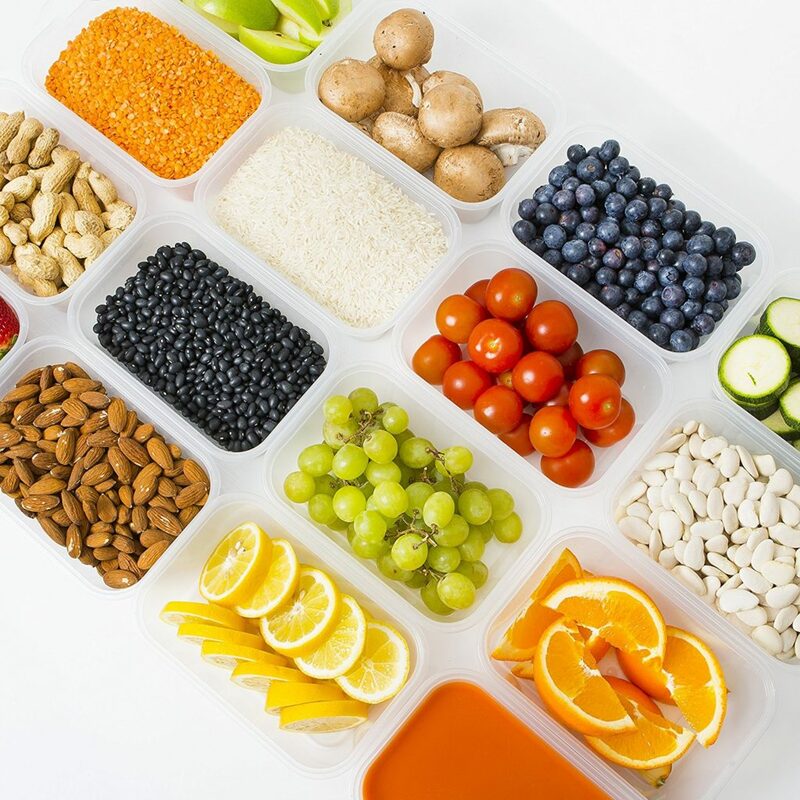 And one of the best ways to maximize the square footage in your cabinets is to pack your food into airtight, rectangular containers, which are much better than irregular shapes or circles at ensuring you’re using every last inch of available space. These reusable containers are the perfect size for simple storage or even meal prep, and they’re safe for the freezer and fridge, too. Plus, these containers give you the opportunity to buy your dry goods in bulk, which is a great way to save money on your food bill in the long run. 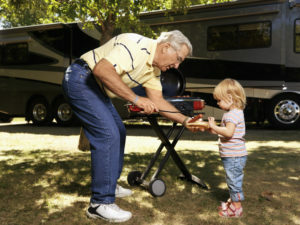 Yes, most developed campgrounds have grills available at their campsites, or otherwise at a community gathering space on-site. But what about those nights you spend boondocking in your favorite remote camping spot? Grilling is just about as classic as camping gets — you shouldn’t miss out on freshly-charred goodies just because you wanted to get off the grid. 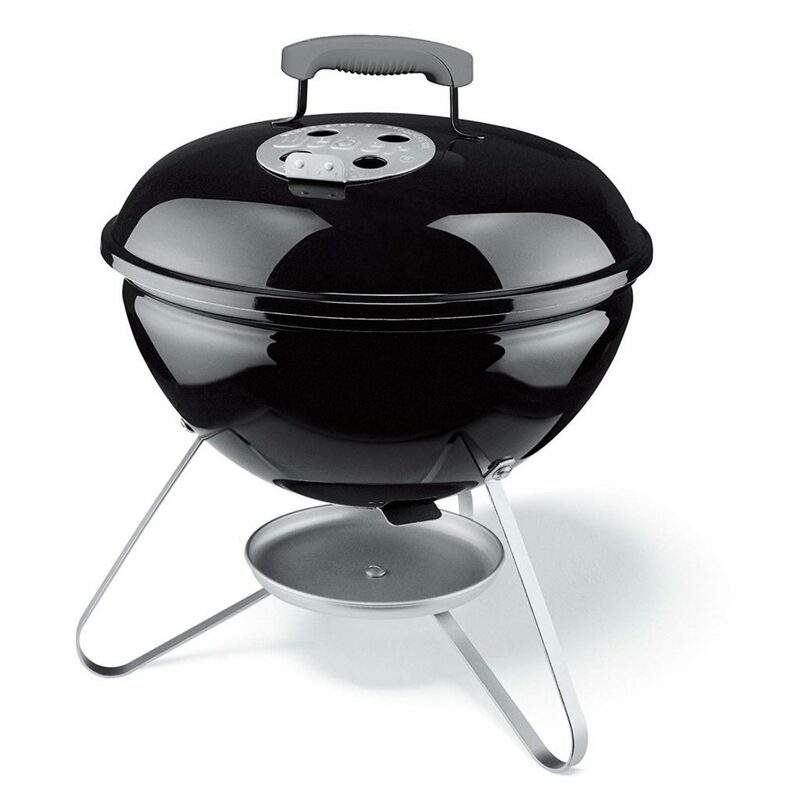 Portable grills are affordable and convenient, easily folding down to a size that’s easily storable in most campers’ basement storage compartment. You can choose between versions that run on propane or charcoal, depending on which fuel source suits you better. Here are a few accessories specifically for travel trailers and towables. 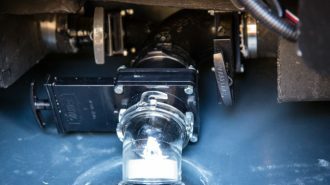 Even once you apply your standard leveling blocks, trailers can be just a little bit more wobbly than their motorcoach counterparts — which is why a set of good wheel chocks is a standard on lists of towable RV equipment. 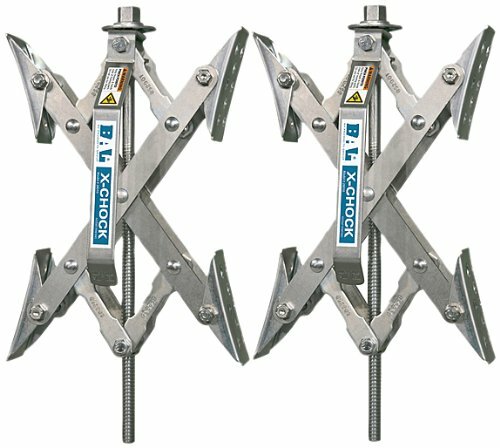 X-Chocks are some of the best-known and most reliable chocks on the market, specially designed to work with your tires’ natural motion rather than against them. They’re simple to use, too, which is probably why they have such stellar reviews on Amazon. Stopping is always a little bit more challenging when you’ve got the hefty weight of a trailer behind you. Electronic brake controllers help you keep… well, control of the situation. And depending on the size of your rig and the state you’re driving it in, it may even be a legal requirement. 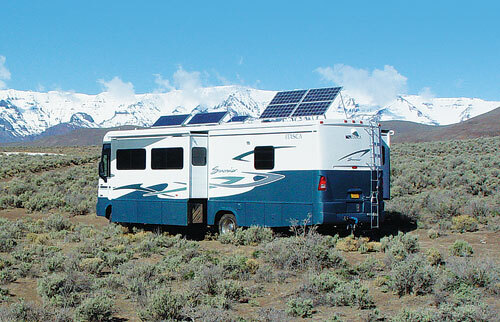 RV accessories might help you have a more enjoyable camping experience, but they can definitely tax your travel budget! 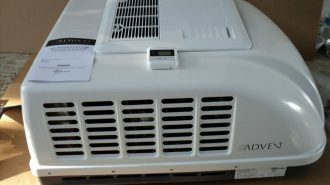 Fortunately, not all RV gadgets cost an arm and a leg — and not all cheap RV accessories are total junk. 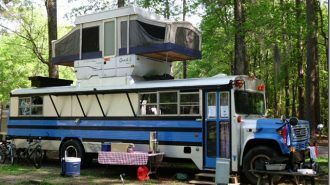 Here’s some cool RV stuff you can find on a shoestring budget. That way, you’ll have money left over for the fun stuff: actually exploring your destination! How many times have you picked up camp and driven happily down the road… only to stop at a gas station and realize your stairs had been extended the whole time? 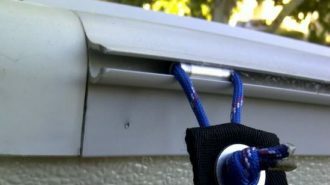 What about your satellite antenna or your slide out locks? These kinds of errors happen to everyone, even veteran campers — but they can be inconvenient or even dangerous if you don’t catch them pretty quickly! 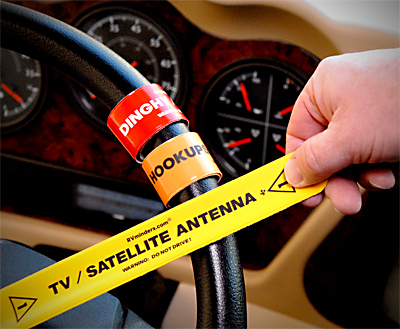 Enter RVminders, a set of 10 slap-bracelet-style warnings you can stick to your steering wheel every time you set up camp. Then, you won’t be able to get going again without removing and looking at them… and you’ll remember to take a peek at all those pesky possible problems! RVminders include a couple of blank strips, too, so you can write down your own bugaboos. Click here to order your own set for just $20! Hey, you’ve gotta have kitchen towels on board anyway, right? Why not make them thematically appropriate? 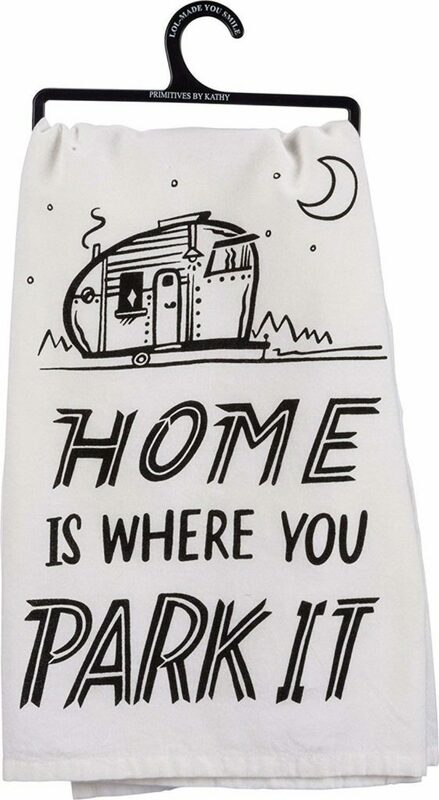 This adorable set of kitchen towels will brighten any RV’s galley, and it comes complete with a dragonfly charm to “help bring you joy as you travel along life’s way.” It might not be the most essential or life-changing of the RV gadgets on this list, but a daily smile makes every destination better. Traveling with your own bathroom aboard is great and all… but you’d think with all the technology that’s been poured into RV innovations over the last century or so, they’d come up with a way to include a nice, strong shower stream. Unfortunately, in most rigs, that’s not the case. 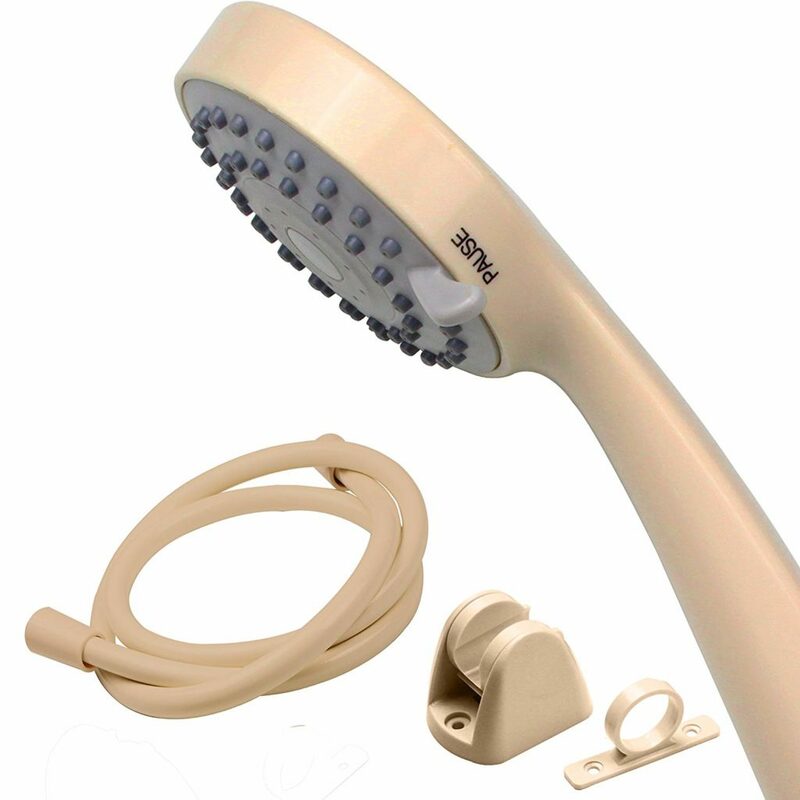 But a replacement shower head will only run you about $20, and if you’ve ever struggled to get that last bit of shampoo out of your hair under a trickling stream, you know that’s a very fair price. Plus, many of these high-pressure shower heads will also help you save water, which is good for the Earth and for the length of your boondocking trip! Those boots are made for walking, and that rig is made for traveling — all around these United States of ours, and beyond. 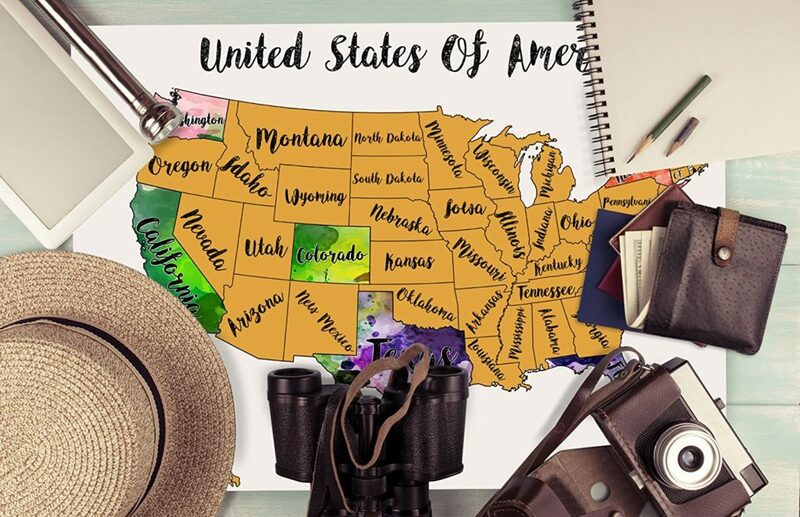 A state tracking map, like this beautiful watercolor version from McScoutMaps is an easy and affordable way to remember your journeys. Kids especially love to scratch off each state as you make your way across the country! Obviously, you’ll want to display your travel map prominently inside your rig. 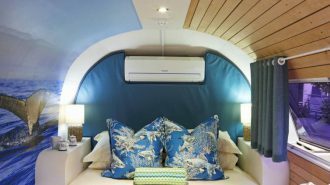 Here’s our guide to mounting on your RV’s interior walls — both for your travel map and other artworks and accessories. Instead of simply adding WiFi hotspots and other connectivity solutions to this list, we thought we’d expand it out into its whole own category. After all, in today’s world, you really can’t get by without an internet connection for very long: You use it for everything from staying in touch with friends to everyday chores like mobile banking. Heck, you may even be lucky enough to make your living remotely, which means you depend on the ‘net to get to work! Staying online while on the road has been a notoriously tricky problem since the internet became a thing back in the 90s. But fortunately, as demand has increased, so have the options for getting on the web and staying there reliably. Lots of developed campgrounds offer high-speed, campus-wide WiFi as part of their standard accommodations, rolling it into the advertised nightly fee. However, the number of campers trying to access the web at any given time can take a toll on the bandwidth, resulting in slow, or sometimes even unusable, network speeds. Some motorhome owners dodge this problem by installing WiFi extenders or repeaters, which can help strengthen a shaky signal. 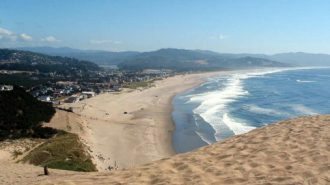 But hotspots can be a more reliable option, especially if you plan on doing any off-grid camping, or boondocking, where there won’t be any WiFi connection at all. A WiFi hotspot is a small device that broadcasts internet signal through cellular data, which you can then connect to on your desktop computer or mobile device. However, along with the cost of the hotspot itself, you’ll also need to purchase a data plan, just like you do with your smartphone, which will be priced according to how much data you use in a given time period. 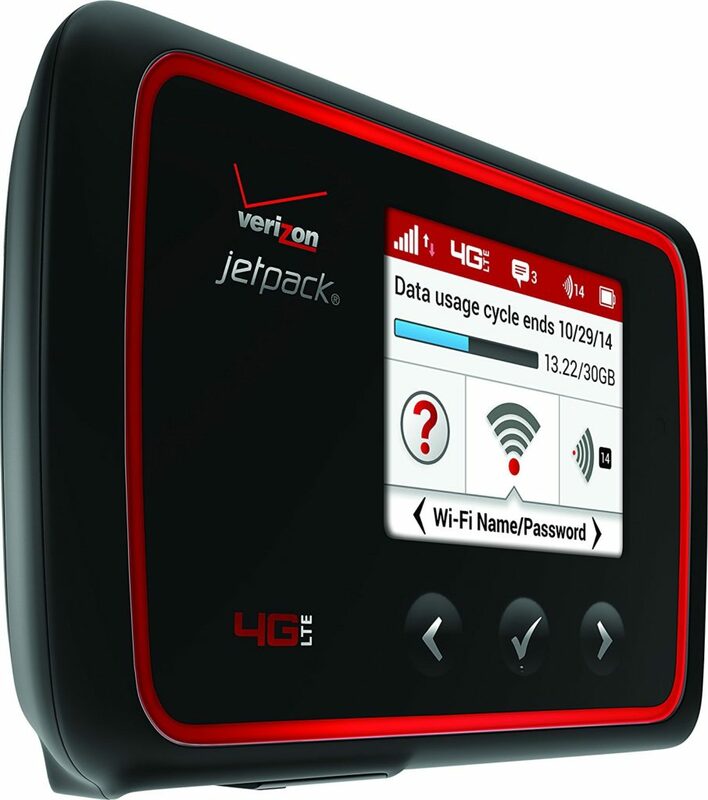 Which WiFi hotspot will be best for you will depend on a variety of factors, such as where you’re primarily doing most of your camping — different carriers have different coverage. Furthermore, if you already have cell service through a given carrier, it may make more sense to add a hotspot to your existing plan than to purchase an entirely new data plan from a different carrier just for the purpose of the hot spot. To learn even more about staying connected on the road, check out our post about the best ways to stay online anywhere here. 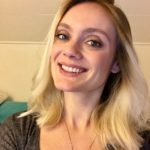 We’ve also written about ways to make money online, which can free you up to travel year round! As game-changing as investing in the right RV accessories can be, it’s equally important to take good care of your existing RV components. That way, you can ensure they’ll last as long as possible, which will help you save money and avoid headaches on your excursions. 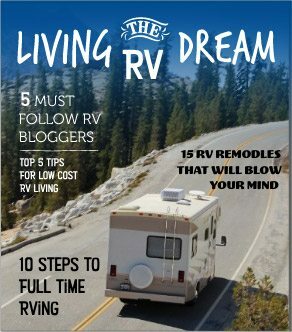 Fortunately, we’ve written a whole lot about the proper maintenance techniques for a wide variety of RV gear and moving parts. 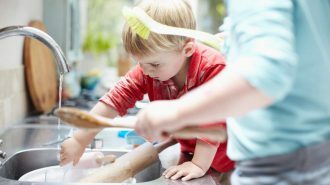 (And even more fortunately, most of these DIY repairs and maintenance tips are so easy, a child could do them.) From cleaning your RV awning to figuring out which RV repair supplies you need to have on board, here are a few RVshare articles that’ll help you keep your rig in ship shape for years to come. Although RV superstores like Camping World are great resources, you don’t have to go to a brick and mortar store anymore to find top-of-the line RV accessories. Reliable, affordable parts can be shipped directly to your door from websites like Amazon, or even Walmart! Better yet, these sites give you the added advantage of being able to see user reviews before you purchase them, which can help you get a sense of how well they work and whether or not they stand up to the test of time. Thanks to the growing demand in the RV industry, the accessories we’ve listed here are more readily and cheaply available than ever. And that means it’s totally within your reach to enjoy a worry-free camping trip with all the gadgets and gear you need — and more, if experience has anything to say about it. 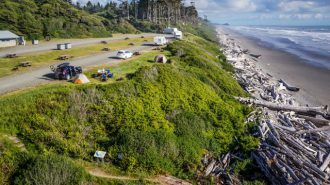 From kitchen gizmos to fun extras like state-tracking maps to the brake controller that keeps your travel trailer safe and compliant, there’s never been a better time to be an RVer.